Provins : Although not quite in Burgundy (Provins lies on the southern edge of Ile de France) this historic town is certainly worth a stop. Surrounded by medieval walls built between the 11th and 13th centuries, Provins is an ancient market town best known today for its festivals. UNESCO recognized, the town is crowned by a 12th century castle open for exploration. I spent a memorable evening in Provins a few years ago, enjoying a true French dining experience at Hostellerie de la Croix d’Or, located in a 13th century building said to be the oldest hotel in France. I enjoyed staying in this B&B in a lovely home. 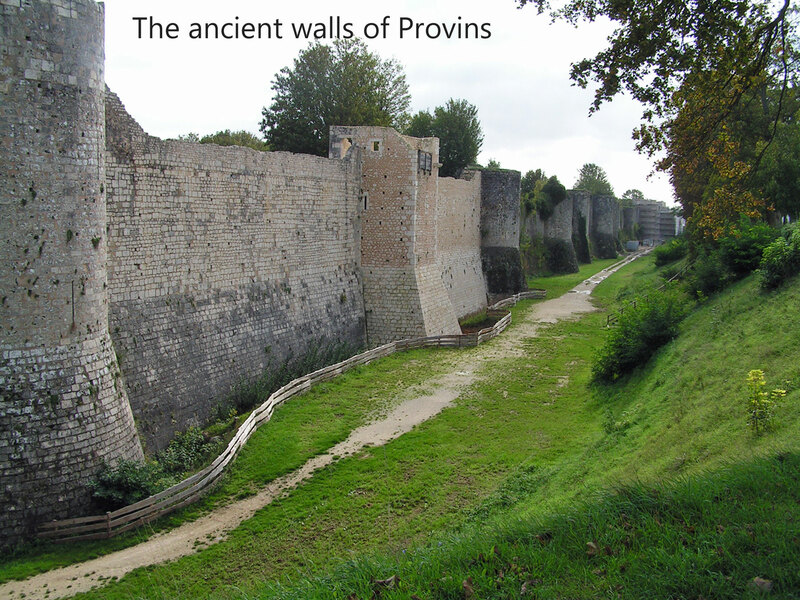 Leave Provins on Highway D403 from the southwest side of the town. At Jutigny take Highway D412 south into Sens. 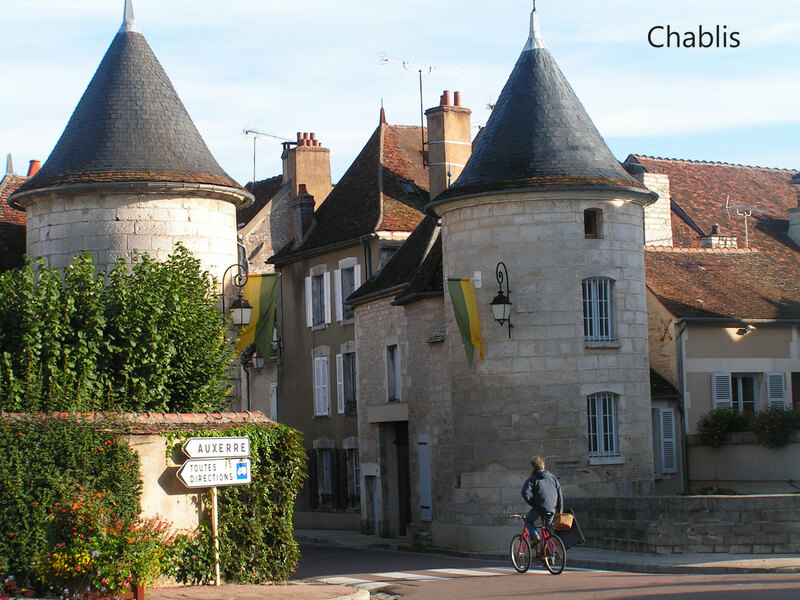 Villeneuve-sur-Yonne: This “new town” (the meaning of “Villeneuve”) was begun by the king of France in 1163. 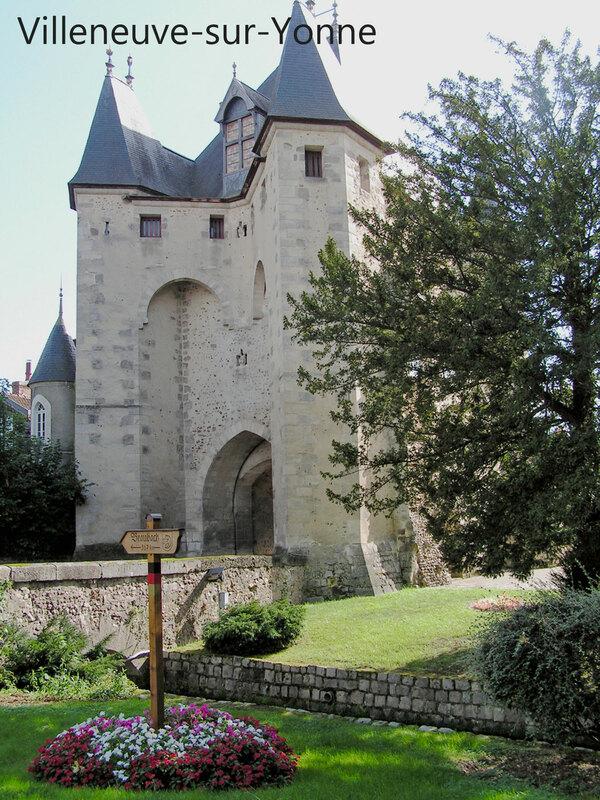 It is guarded at its north and south entrances by a pair of gates known as the Porte de Sens (built in the 13th century) and the Porte de Joigny (built 300 years later). Today each gatehouse contains a small museum. A lovely park follows the ancient town walls from one porte to the other — a delightful spot for a picnic lunch. Joigny: sited on the hillside above the river Yonne, this small city is known for fine restaurants and for the carvings on the front of some of its old houses. 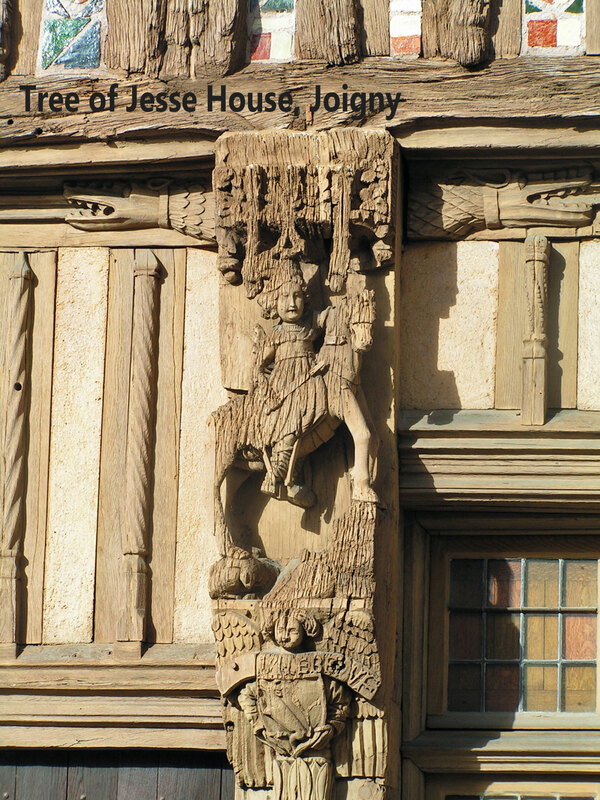 The most famous is called the Tree of Jesse house (Arbre de Jessé). Auxerre : The government center of the Yonne department, Auxerre is a busy commercial city with an historic town center built alont 5he river Yonne. A 15th century clock tower stands in the center of the city. In the streets near the tower three painted wooden sculptures by the artist Francois Brochet can be seen. Charming in their simplicity, they honor famous residents of Auxerre: Nicholas-Edme Restif de la Bretonne (shown sharing a book with a woman); Marie Noel, famous in France for her poetry; and Cadet Roussel, who became an 18th century celebrity when a song about him became popular in France. The streets of Auxerre wind up the hill from the river. They’re lined with medieval homes, many of which house interesting shops at the street level. Walking tours and boat rides are offered in warm-weather months. 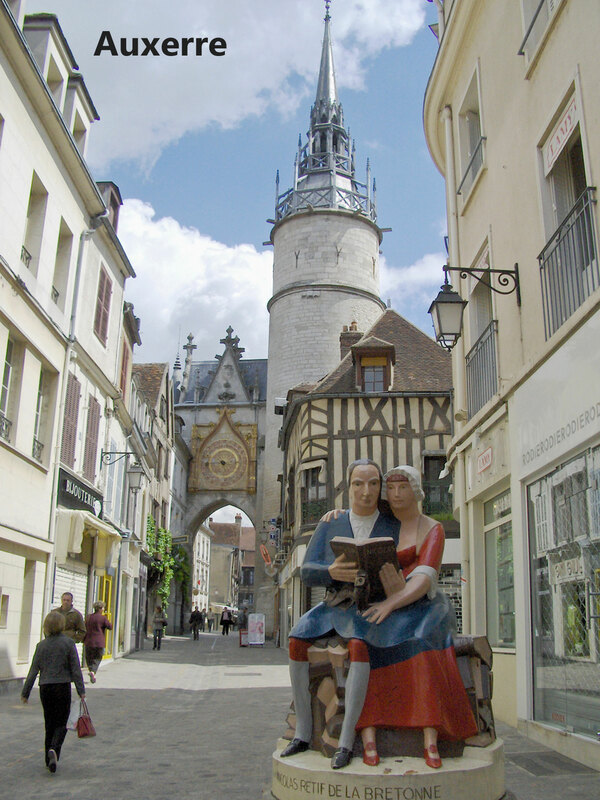 The online Michelin guide provides detailed information about many ancient places to explore in Auxerre. From Auxerre drive east on Highway N65. Chablis : Famous for centuries for the delicious white wine that bears its name, Chablis is a busy small town surrounded by vineyards. The Sunday morning market is the highlight of the week. Read my post about that here. From Chablis follow Highway D91 south and then Highway D956 southeast to Noyers. 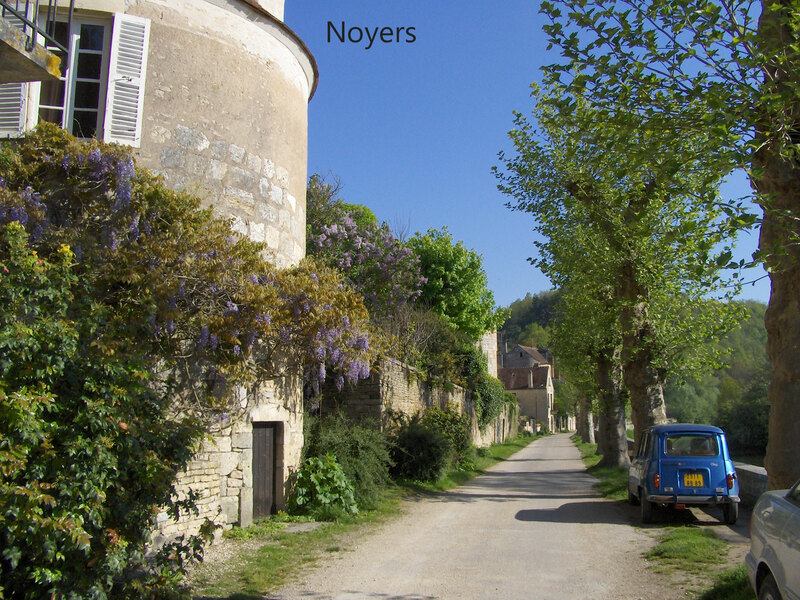 Noyers : My favorite place in Burgundy, Noyers is a picture-perfect medieval French Village. Read more here. Leaving Noyers, follow Highway D956 east to D905, then take D905 southeast to Fontenany abbey, just past the village of Montbard. Fontenay : The abbey church at Fontenay was consecrated in the year 1147 and you can experience its simple grandeur today. 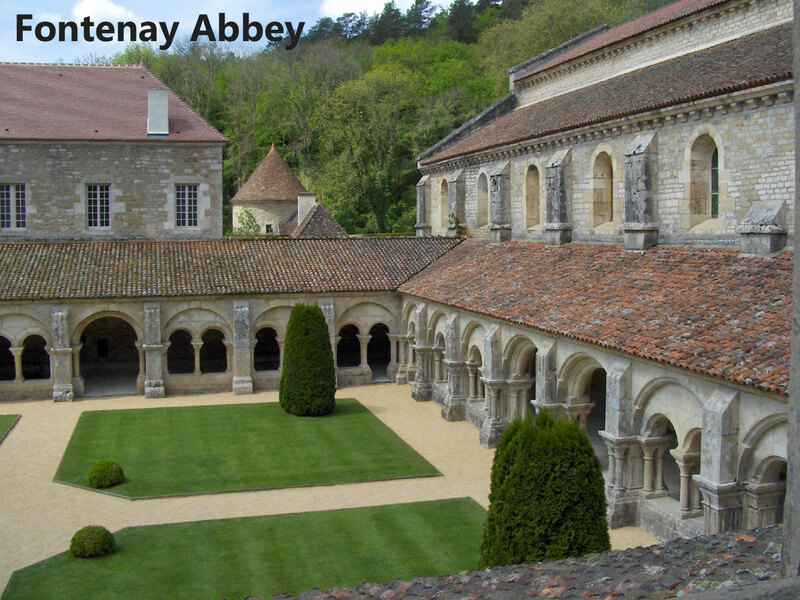 Founded more than a century earlier, it was one of the most important abbeys in France. The abbey and the church are very much as they were when built. They have been totally restored and are privately owned. 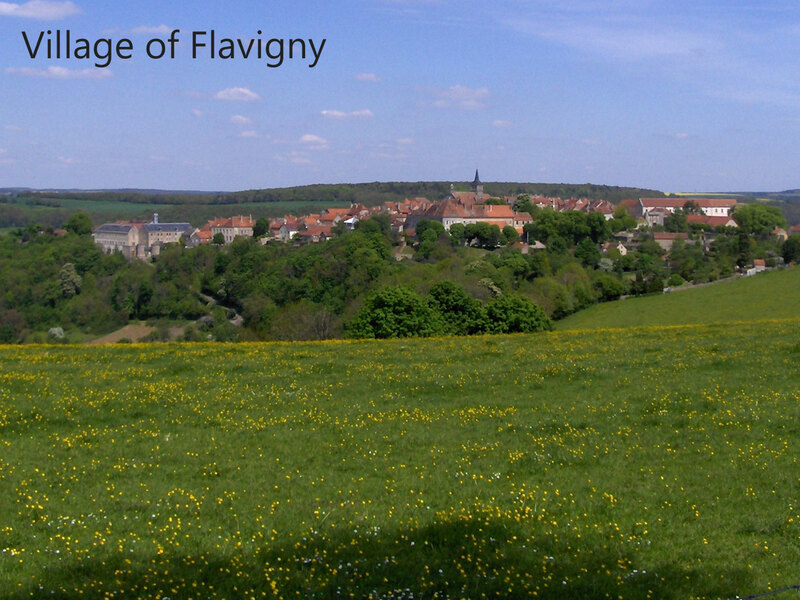 Flavigny : Did you see the movie Chocolat made in 2000 and starring Juliet Binoche and Johnny Depp? If you loved it as much as I did you may wish to visit the village where the outdoor scenes were filmed. The church which plays a prominent role in the film can be visited by asking for the key at the tourist office where a lady will tell you how the shops along the street were used in the film. 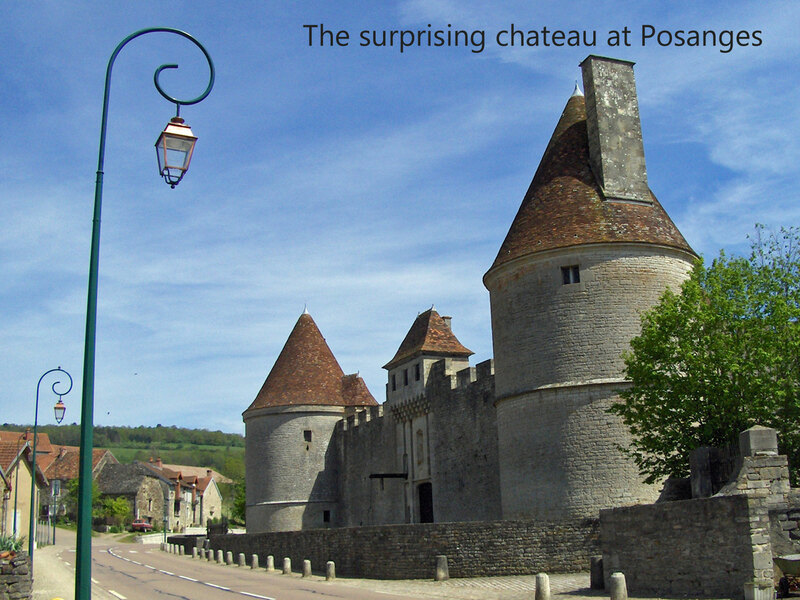 Posanges: just a stop along the road but one you’re not likely to forget because by the side of the narrow highway you’ll find a true fairy tale castle surrounded by a moat! Four turrets capped by “witch’s hat” roofs form the corners of a wall completely surrounding the chateau constructed between 1440-1445. Privately ownership means entry to the chateau is very infrequent but you can watch this YouTube video for a peek inside. To see some aerial views, click here. 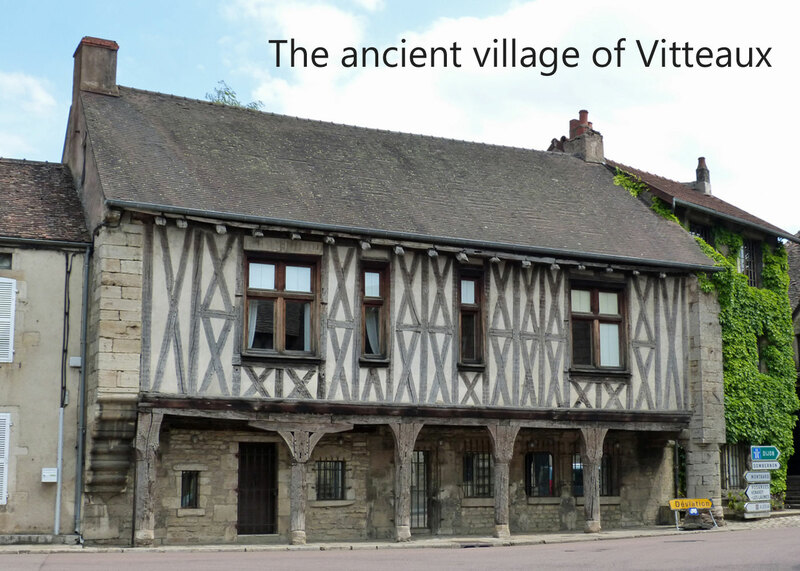 Vitteaux: Only a short distance past the chateau you’ll enter an ancient village that’s changed very little over the centuries. Found on a map created in the year 945, the town likely owes its existence to Mathilde de Courtenay who built her chateau and the church here in the 13th century. The covered market in the center of the village dates from the 13th and 14th centuries. A detailed walking tour with map and a description of all the oldest properties (in French) can be found here. From Vitteaux following Highway D70 west. It becomes highways D906 and D606 before reaching Vézelay. En route you may wish to explore the towns of Semur-en-Auxois, Epoisses and Avalon. Highway A6 leads toward them. 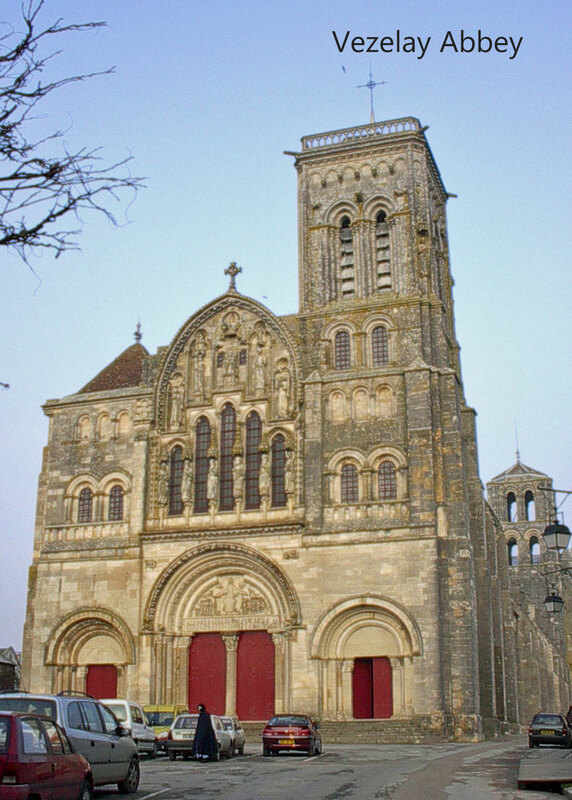 Vézelay: The abbey here is considered by many to be the purest extant Romanesque church in France. Named for St. Mary Magdalene, whose relics (bones) are said to have been housed here, Vézelay was one of the most important sites in medieval France. The Second Crusade departed for Jerusalem from this church, led by Eleanor of Aquitaine and her first husband, King Louis VII of France. Built in the 11th century the abbey basilica was heavily damaged during the wars of religion in France and again following the French Revolution. 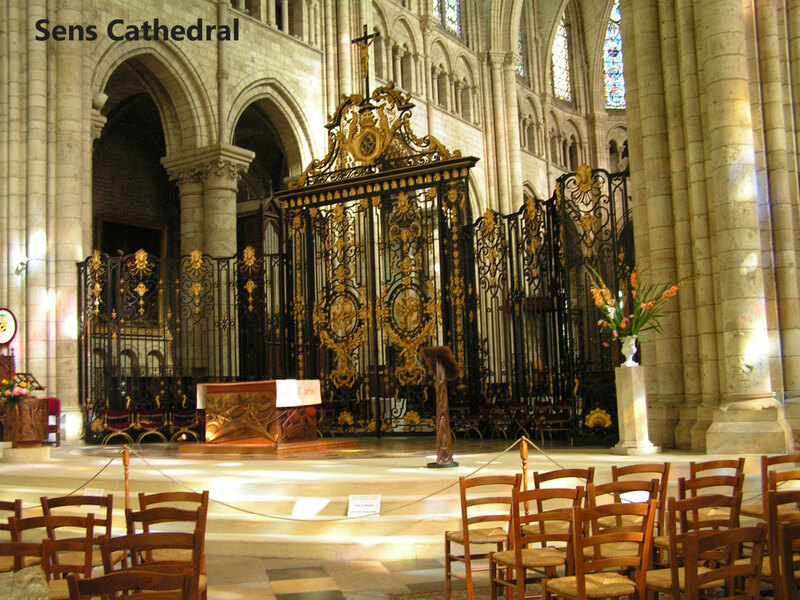 The church was restored in the decade of the 1840s by Eugène Viollet-le-Duc, the architect famous for rescuing and restoring many of the greatest buildings in France including Notre Dame de Paris. The abbey church at Vézelay is best known for the carving over the inner portal (in the narthex) and for its extraordinary carved capitals at the tops of columns supporting the roof. If you’ve driven this far south you’re now about to enter the famous Cote d’Or region of Burgundy. Among the first towns you’ll pass is Autun, a Roman city built around the first century A.D. Fans of early church architecture will enjoy this website about the spectacular Romanesque cathedral at Autun. http://www.burgundytoday.com/ This site is a good guide to Burgundy. Tip: Very often in France you’ll find that the high speed toll roads run alongside the older “national” or “regional” roads which run through the countryside and small villages. Those roads not only enable visitors to see more historical France but they’re also free! For this drive, after reaching Sens depart the A-6 motorway and use the road identified as D606 which will eventually lead to Auxerre, having been renumbered N6 by the time you arrive there.